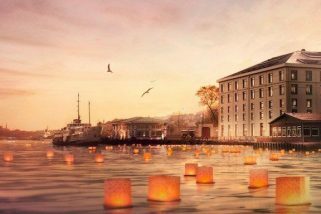 Sumahan on the Water, one of Istanbul’s best-loved luxury boutique hotels, has just launched its new Bosphorus-front contemporary styled restaurant ‘Tapasuma‘, opening its doors for the first time in December 2012. With its name chosen to reflect award-winning Sumahan on the Water’s beginnings as a 19th-century Ottoman distillery (‘tapa’ means cork while ‘suma’ is the first distillation when producing raki, Turkey’s traditional aniseed-flavoured spirit), newly opened Tapasuma serves up top chef Gokay Cakiroglu’s inspirational Turkish dishes with a contemporary twist in a hyper-stylish setting. Alongside freshly caught seasonal fish from the Bosphorus, Cakiroglu, who has a passion for creating new dishes, presents a menu of lesser-known yet enticing dishes from modern Turkish and Mediterranean cuisines. Not to mention the selection of delicious bite-sized Turkish mezzes lined up tapas-style at the restaurant’s 8-metre long “verde calacatta” marble food & drinks bar. Great for informal lunches and evening meals, as it is for special gatherings and celebrations, Tapasuma is an ultra-chic smart-casual dining venue for watching the sun set over the fabled city of Istanbul. The hotel’s own launch, Sumahan I, will even bring guests from across the Bosphorus directly to the restaurant in the quaint and attractive village of Cengelkoy on the Asian shore. There food-lovers can enjoy views of the timeless Bosphorus as it glitters and changes its hues throughout the day ensconced in Tapasuma’s artfully designed surroundings, very much of the now.